Sports Columns | Digital Marketing, Poetry, Reviews, Philosophy, Sports & Tales by Joe Wooldridge. I knew I would get around to writing about sports, but I just didn’t know when. The day has come. ESPN’s Rick Reilly has decided to celebrate Thanksgiving by offering up a TURKEY of a slanted column bashing Brett Favre (http://espn.go.com/espn/story/_/id/7272995/rick-reilly-rodgers-better-favre). I wrote a response, but I doubt he will post it in his ‘mailbag’. So, dear reader, here is my take on the ‘piece’. #1) Video Game Football Rules: I’d like to see how Rodgers would do back in the day when defenses were actually able to defend. Seriously, today’s rules are so pro-offense that the game really resembles a video game rather than FOOTBALL. #2) Iron Man: There is a good chance that Rodgers will never play in half as many games as Favre has. Much less be able to put together any kind of starting streak that would compare. 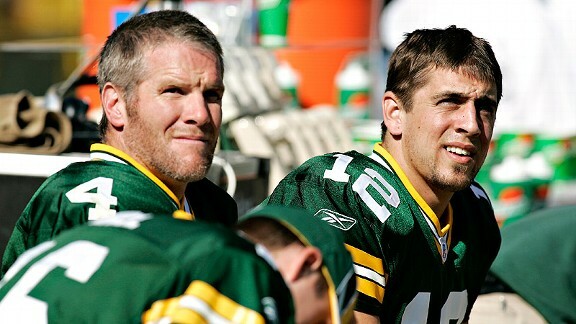 #3) Learning From A Legend: You have to give Favre some credit for Rodgers’ successes. Nothing like having one of the top QB’s of all time to learn from. #4) Judge Value Correctly: Yes, Rodgers is doing well, but you can’t even begin to say that he is better than Favre overall. There’s a reason that Favre has three MVP trophies. Because he was the league’s MOST VALUABLE PLAYER three different years. When Rodgers has four of those MVP trophies, then you can start squawking about who is better. You don’t need a calculator to know that 3 > 0. #5) Respect: Favre is one of the absolute best football players to play the game – EVER. Not just an all-time great QB. Say what you want about the retiring/un-retiring routine. Anyone with half a brain knows that Favre just wanted some rest in the off-season in his later years. He earned it. I’m not sure if there has ever been someone who loved to play football more than Favre. He wasn’t retiring each year. #6) Clutch Play: Ask any NFL coach who they would rather have come in from scratch, walk in off the street, step in and play a big-time game with no prep time? I’m pretty sure every one of them would pick Favre – even an OLD Favre. Sorry about your man-crush on Rodgers. I’m not saying Aaron Rodgers isn’t an excellent QB, but you do both him and Brett Favre a disservice by writing such a poor excuse for a column. Time will tell. Rodgers may not even last very long – even playing under the benefit of the new pro-offense, “don’t touch the quarterback” Flag Football rules.